René García does not have any MLB stats for the season. Draft: 2008, Houston Astros, 35th rd. November 27, 2017 C Rene Garcia assigned to Leones del Escogido. November 6, 2017 C Rene Garcia elected free agency. September 7, 2017 C Rene Garcia assigned to Biloxi Shuckers from Colorado Springs Sky Sox. August 4, 2017 C Rene Garcia assigned to Colorado Springs Sky Sox from Biloxi Shuckers. July 13, 2017 C Rene Garcia assigned to Biloxi Shuckers from Colorado Springs Sky Sox. July 9, 2017 Colorado Springs Sky Sox activated C Rene Garcia from the 7-day disabled list. June 26, 2017 Colorado Springs Sky Sox placed C Rene Garcia on the 7-day disabled list retroactive to June 25, 2017. May 15, 2017 C Rene Garcia assigned to Colorado Springs Sky Sox. January 27, 2017 C Rene Garcia assigned to Puerto Rico. January 12, 2017 C Rene Garcia assigned to Colorado Springs Sky Sox. 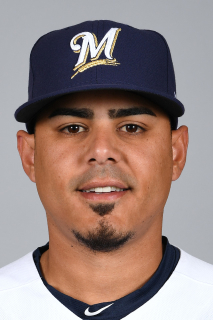 December 9, 2016 Milwaukee Brewers signed free agent C Rene Garcia to a minor league contract and invited him to spring training. November 7, 2016 C Rene Garcia elected free agency. October 14, 2016 C Rene Garcia assigned to Gigantes de Carolina. September 30, 2016 Biloxi Shuckers activated C Rene Garcia from the 7-day disabled list. September 3, 2016 Biloxi Shuckers placed C Rene Garcia on the 7-day disabled list. August 5, 2016 C Rene Garcia assigned to Biloxi Shuckers from Colorado Springs Sky Sox. July 31, 2016 C Rene Garcia assigned to Colorado Springs Sky Sox from Biloxi Shuckers. July 18, 2016 C Rene Garcia assigned to Biloxi Shuckers from Colorado Springs Sky Sox. June 15, 2016 C Rene Garcia assigned to Colorado Springs Sky Sox from Biloxi Shuckers. April 2, 2016 C Rene Garcia assigned to Biloxi Shuckers from Colorado Springs Sky Sox. January 30, 2016 C Rene Garcia assigned to Puerto Rico. January 2, 2016 C Rene Garcia assigned to Tigres del Licey. November 29, 2015 C Rene Garcia assigned to Colorado Springs Sky Sox. November 19, 2015 Milwaukee Brewers signed free agent C Rene Garcia to a minor league contract and invited him to spring training. November 6, 2015 C Rene Garcia elected free agency. June 25, 2015 Reading Fightin Phils activated C Rene Garcia from the bereavement list. June 22, 2015 Reading Fightin Phils placed C Rene Garcia on the bereavement list. May 22, 2015 Reading Fightin Phils activated C Rene Garcia from the 7-day disabled list. May 8, 2015 C Rene Garcia assigned to Reading Fightin Phils from Lehigh Valley IronPigs. January 30, 2015 C Rene Garcia assigned to Puerto Rico. November 25, 2014 Philadelphia Phillies signed free agent C Rene Garcia to a minor league contract and invited him to spring training. November 25, 2014 C Rene Garcia assigned to Lehigh Valley IronPigs. October 30, 2014 C Rene Garcia assigned to Gigantes de Carolina. October 30, 2014 C Rene Garcia roster status changed by Gigantes de Carolina. October 17, 2014 C Rene Garcia assigned to Aguilas Cibaenas. April 2, 2014 C Rene Garcia assigned to Corpus Christi Hooks from Oklahoma City RedHawks. January 14, 2014 Houston Astros invited non-roster C Rene Garcia to spring training. November 1, 2013 C Rene Garcia assigned to Gigantes de Carolina. August 1, 2013 C Rene Garcia assigned to Oklahoma City RedHawks from Corpus Christi Hooks. January 17, 2013 Houston Astros invited non-roster C Rene Garcia to spring training. September 20, 2012 Rene Garcia roster status changed by Corpus Christi Hooks. July 29, 2012 Corpus Christi Hooks placed C Rene Garcia on the 7-day disabled list. July 15, 2012 C Rene Garcia assigned to Corpus Christi Hooks from Lancaster JetHawks. February 18, 2012 Houston Astros invited non-roster C Rene Garcia to spring training. November 4, 2011 C Rene Garcia assigned to Gigantes de Carolina. January 12, 2011 Houston Astros invited non-roster C Rene Garcia to spring training. September 1, 2010 Rene Garcia assigned to Lancaster JetHawks from Lexington Legends. August 31, 2010 C Rene Garcia roster status changed by Lexington Legends. August 8, 2010 Lexington Legends placed C Rene Garcia on the 7-day disabled list. Elbow soreness. April 6, 2010 C Rene Garcia assigned to Lexington Legends from Tri-City ValleyCats. November 11, 2009 C Rene Garcia assigned to Leones de Ponce. June 18, 2009 Rene Garcia assigned to Tri-City ValleyCats from Greeneville Astros.